Drying herbs in a dehydrator is the easiest thing to do. You just have to take care of certain points and you will have dehydrated herbs with you in no time at all. 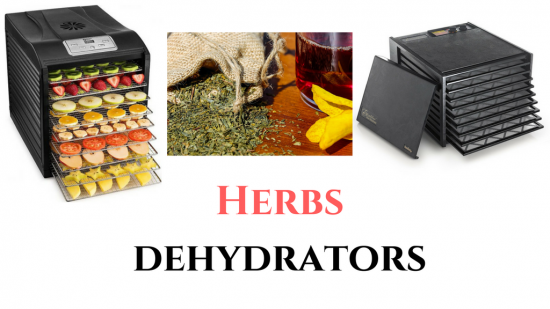 In this article, we are going to take a look at some dehydrators that are best suited for drying herbs. We have chosen these dehydrators after thorough research and consideration by looking into and comparing the features and specifications of every dehydrator mentioned in this article. By the end of this article, you will be able to make a much better and informed decision regarding which dehydrator you want to buy for drying herbs. If you’re looking to buy a dehydrator for drying herbs, there are several choices available in the market. Here are few features you should look for while choosing a dehydrator. When you need to dehydrate herbs, you should do this at the lowest temperature possible, as high temperature can damage the herbs by making them too brittle and dry. So, choose a dehydrator that offers a thermostat option for controlling the temperature. Temperature between 95-115 degrees F is suitable for drying herbs, but you can change the temperature depending on the moisture content in your area. Certain herbs need to be dried for a particular time period. 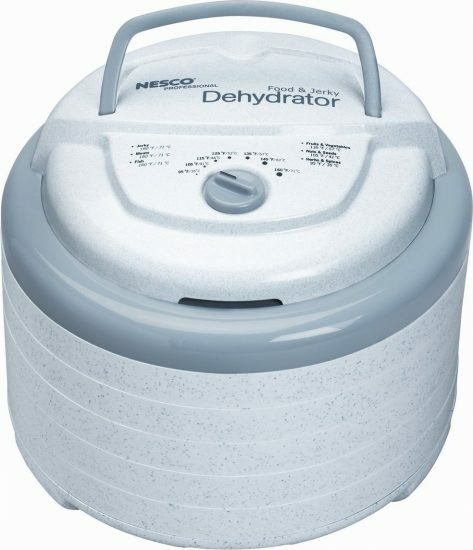 In case you choose a dehydrator that does not have a thermostat, you can look for one with a timer option so that you can set a time for dehydration. Keeping herbs on the trays needs more space than usual because herbs tend to air out as they lose moisture. Having more space between the trays will help the herbs to dry out more efficiently and quickly. If you’re into drying large amounts of herbs, you need to get a bigger dehydrator so that you can be done with drying herbs sooner. If you get a small sized dehydrator, it will take you multiple drying sessions to dry an equal amount of herbs. Choosing the b﻿﻿est dehydrators for herbs is not easy and here are some things that we kept in mind while choosing these dehydrators. We read through countless user reviews of the dehydrators and checked the performance of the dehydrators for drying all kinds of herbs. We gave a higher ranking to the dehydrators that did a better job at drying herbs. Users often leave star ratings instead of writing reviews. We also looked through these ratings to check which dehydrators got a better rating from users. We took into account features like Timer, Adjustable Thermostat, and number of trays, expandable trays and more to rate the dehydrators accordingly. An extensive warranty is a must for any dehydrator. There are times when things go wrong with these machines and having a solid warranty can help you to get replacements or repairs easily. We gave a higher ranking to the dehydrators that had a longer warranty period. A dehydrator with more power will be able to dry the herbs quickly and more efficiently. We gave a higher rating to dehydrators that had more power. The Magic Mill Food Dehydrator bundle is ideal for drying all kinds of herbs quickly and efficiently. The dehydrator has an extensive temperature range of 95-158 degrees F. You can use the countdown timer to dry the herbs for your desired time period. The dehydrator is easy to use and it comes with a range of features that make drying food an enjoyable experience. With 9 stainless steel trays you can dry large batches of herbs easily. Let’s take a look at the features and specifications of this unit. If you’re in the market for a complete bundle that offers you all the features you’re looking for in a dehydrator, this is the dehydrator unit you should choose. It offers ample space for drying herbs and you can set up the timer and temperature to dry the herbs as per your requirement. The dehydrator unit is easy to operate and the high quality trays make sure you will be using these for a long time to come. You can dry a large amount of herbs in one batch in this dehydrator. Get this unit today. The Excalibur brand is known for providing quality dehydrators that are designed for varying uses in homes. Whether you want to dry meat or herbs, these dehydrators are ideal for the task. 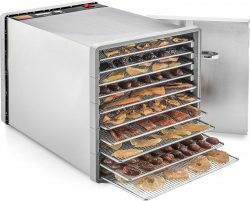 The Excalibur 3926TB offers extensive capacity with 9 trays and it also comes with a thermostat and a timer so that you can use it to dry herbs as per the time and temperature chosen by you. The dehydrator is easy to operate and it comes with high quality trays that are best suitable for drying various foods and you can easily use these to dry herbs as well. The Nesco FD-75A is a useful and powerful dehydrator that can be used for drying herbs quickly and efficiently. This round shapes dehydrator offers multiple temperature settings for choosing the right temperature at which to dry the herbs. The Nesco FD-75A is a powerful unit that offers drying power of up to 600 watts. The temperature can be controlled as per your requirements and you can easily dry all kinds of herbs in this dehydrator. The dehydrator is made from high quality materials and the design of the unit looks good on any modern kitchen shelf. 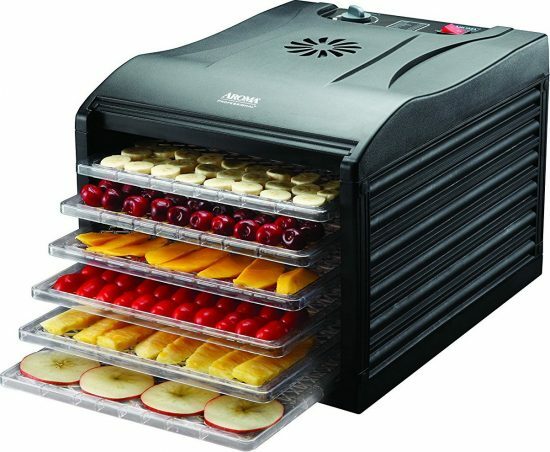 If you’re looking for a dehydrator that will work for years to come, get this unit today. The Gourmia GFD1650 Premium Countertop Food Dehydrator is the ideal dehydrator for drying a wide range of herbs. The dehydrator is made from quality materials and it comes with several features that make using this dehydrator a complete joy. The digital thermostat allows you to set the right temperature you need to dry herbs properly. There is also a timer that you can use to set up a time for which the dehydrator will be on. The unique Circusmart 360 Air Flow Circulation Technology makes sure all trays get an equal amount of heat and dry up properly. Here’s more information about the features and specifications of this unit. The Gourmia GFD1650 is a Premium Countertop Food Dehydrator that has a square design that looks good on any kitchen countertop. The dehydrator is designed with customer requirements in mind and it provides an efficient drying experience for all kinds of herbs, fruits, and meats. The six trays of the dehydrator offer ample space for drying and there is no need to switch trays either as the efficient drying system makes sure all trays get an equal amount of heat. If you’re looking for a dehydrator that’s powerful and offers an amazing performance, get this unit today. 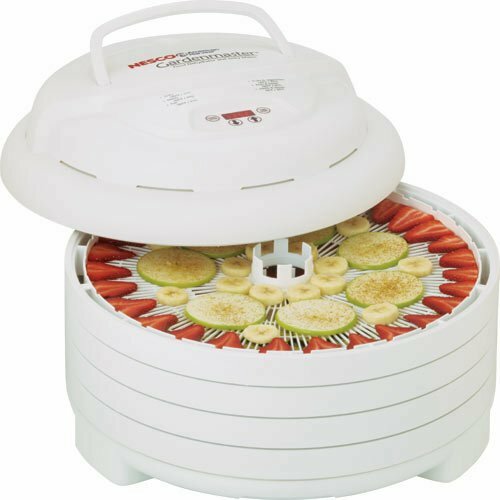 Made by Nesco, the FD-1040 Gardenmaster Food Dehydrator is a powerful unit that offers up to 1000 watts of drying power. 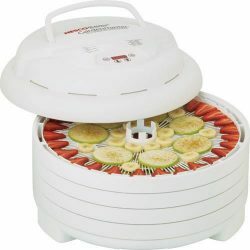 The dehydrator is easy to use and it can be expanded up to 20 trays. With this much capacity available, you will never need to dry multiple batches of herbs. You can set up the timer and temperature at which you want to dry the herbs and the unit does the rest. Made from high quality materials, the dehydrator looks great on a kitchen shelf and it also makes drying easier as the Converga-Flow technology ensures all trays get an equal amount of heat. Here’s a look at the rest of features and specifications of this unit. The Nesco FD-1040 is just the dehydrator you need when you have to dry large batches of herbs. 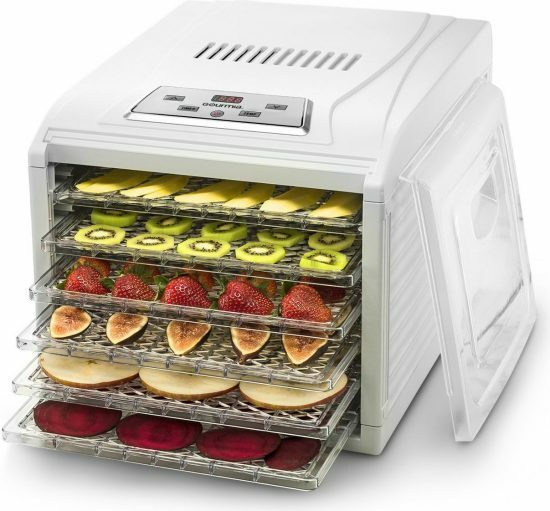 You can add to the capacity of this dehydrator by adding up to 20 trays. 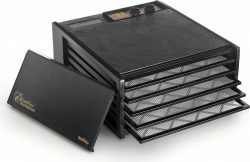 The unique feature of the dehydrator is the Converga-Flow system of heating that makes sure all trays get equal amount of heat. This dehydrator brings power and performance in one single package. 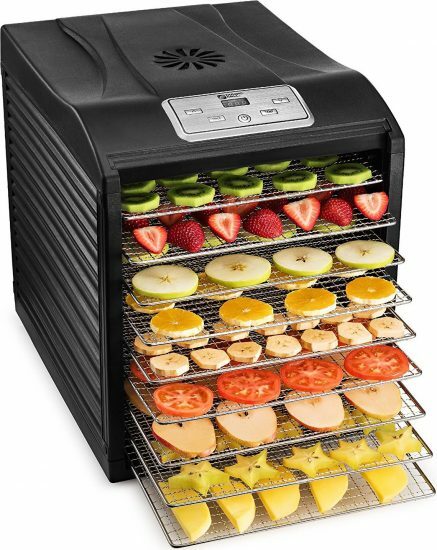 If you’re looking for a powerhouse dehydrator, get this unit today. 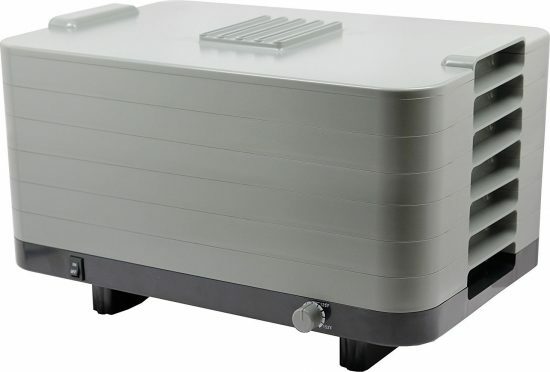 The L’EQUIP 528 is a 6 tray dehydrator that offers a range of unique features that are ideal for dehydration of herbs. The dehydrator comes with the Centra Flow air design and ensures efficient distribution of air throughout the trays of the dehydrator. The number of trays in this dehydrator can be added up to 12 and it already comes with six trays. With 1.2 square feet of drying area per tray, you will never feel the lack of space for drying when you want to dry large batches of herbs from your garden using this dehydrator. Here’s a look at some more features and specifications of this dehydrator. This is a large sized dehydrator that offers an excellent way to dry all the herbs you want. The large trays of the dehydrator offer ample drying space and you can also add more trays in case you need to dry a large amount of herbs in one session. The unit has a thermostat and you can set up the temperature as needed. There is no timer on the unit, so you will need to use an external timer to check how long the herbs have been drying. If you’re looking for a unique dehydrator with a modern design and excellent drying ability, pick this one today. 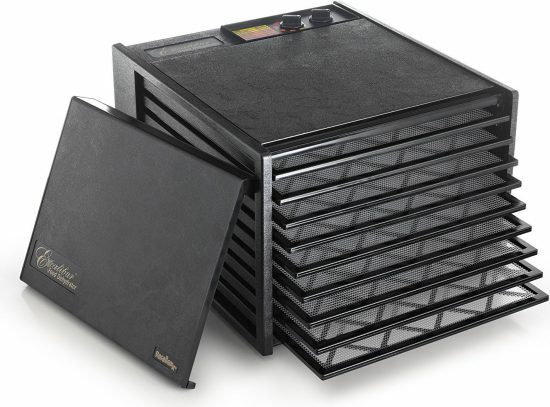 The Excalibur 3526TB is a 5 tray dehydrator that comes offers 8 square feet of drying space. The dehydrator offers immense drying power with a 400 watts motor and you can easily dry most types of herbs in this dehydrator. If you plan to dry small batches of herbs every now and then, this is the one dehydrator that will suit all your needs. The unit also comes with an adjustable thermostat and a timer so that you can set up the dehydrator and let it do its work. Here are some more features and specifications of this unit. 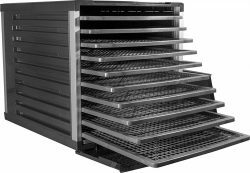 Excalibur is a trusted name in the dehydrator segment and the company manufactures some of the best models of dehydrators in the market. The Excalibur 3526TB offers ample space for drying all kinds of food easily. If you’re into drying herbs and you only want to dry small batches in the beginning, this is the perfect dehydrator for that. You can control the timer and temperature as per your recipe requirements and you can dry herbs in no time at all. This is an efficient, well-designed, and powerful unit. The Aroma Housewares Professional 6 Tray Food Dehydrator is a large sized dehydrator that is ideal for drying fruits, meats, herbs, nuts and more. The dehydrator offers ample drying capacity and you can use the six trays to dry large quantities of foods of your choice. The circulating air flow of the dehydrator removes the need to rotate trays through the drying process. The fan is rear mounted which helps in adding an extra crispness and dryness to the foods. Here’s a look at the rest of features and specifications of this unit. If you’re looking for a dehydrator that offers power as well as capacity, this is the ideal unit for you. The dehydrator has space for six trays and you can also remove the trays to make space for large utensils in case you want to make yogurt in the dehydrator. The thermostat makes this dehydrator ideal for drying herbs as you can set temperature for which the herbs should dry out. The automatic fan makes drying even more optimal and adds to the efficiency of drying. Get this unit today! The STX International Dehydrator offers immense capacity with 10 trays and 600 watts of drying power. The dehydrator is ideal for drying all kinds of food and you can also dry herbs in this unit. The dehydrator comes with a stainless steel construction, heat retentive front door, and a horizontal air flow system that distributes hot air equally all over the trays. With a rear mounted motor, there is no need to rotate the trays. You can set up the time and temperature you need to dehydrate your herbs and simply switch it on. Here’s a look at the rest of features and specifications of this dehydrator. The STX International Dehydrator is an exceptional unit that offers power and performance in one package. The dehydrator is easy to use and you can dry large batches of herbs in this dehydrator as the ten trays offer immense capacity. The trays are designed in a way that you don’t even need to insert polyscreen mesh trays. The trays are also dishwasher safe so that once you’re done drying the food, you can clean the trays in your dishwasher. This is a full-featured unit that comes with all you could ask from a dehydrator. Get it today! The LEM food dehydrator offers immense capacity with 10 trays that can be used to dry large batches of foods. The trays are square in size which means you can use them any way you like. The dehydrator is a powerful unit that offers up to 800 watts of drying power. The digital times on this unit comes with an automatic shut off so that you can set the timer and go about your work while the dehydrator will dry the food and shut off on its own. The large drip tray at the bottom of this dehydrator will collect all the food drippings so that it’s easier to clean. Here’s a look at the rest of features and specifications of this unit. The LEM 1153 Dehydrator is an exceptional unit that offers a range of useful features that are designed with the end user in mind. It is the ideal dehydrator for drying all kinds of herbs as the 10 trays can be used for drying large batches easily. With 800 watts of power, you will be done drying the herbs in no time at all. The door of the dehydrator also deserves a mention as it is made of transparent material that traps heat. So you can view the progress of the dehydration without opening the unit. This dehydrator is an exceptional unit that is a must buy for anyone who is serious about dehydration. Users often have questions and queries about dehydrators. Here are some of the common and frequently asked questions about dehydrators. Q: I just bought a dehydrator for drying herbs. What temperature should I dry these at? If you’re just starting dehydrating herbs, keep in mind that herbs can be quite delicate so you need to dry these at the lowest temperature setting available in your dehydrator. Keep checking the herbs every few hours and once the herbs are brittle, you can take these out and store them. Q: Is there anything I need to do before drying the herbs? You can wash the herbs and let them dry. Make sure you take out any rotten leaves or sticks that might have come in with the herbs. Place the herbs in the dehydrator but make sure you don’t pile them all on tray. Give them enough breathing space so that they can dry properly. Q: I bought a square shaped dehydrator with a fan at the back. Do I still need to rotate trays? If your dehydrator has a fan at the back, you probably don’t need to rotate the trays as units with fans at the back are pretty efficient in drying all the trays. But if all depends on the kind of results you are looking for and the model of dehydrator that you have. If you feel that any trays are not getting dried properly, switch the trays and check again. Q: My dehydrator is dirty from previous uses. Now I want to clean it and dry herbs in it. What is the best way to go about cleaning the dehydrator? You can use a diluted soap solution and a soft cloth to wipe the grime from the inside of the dehydrator. For hard to reach areas, use a small toothbrush and wipe away the rest with a cloth. Trays are best cleaned after leaving them in a soap solution overnight. If your trays are dishwasher safe, you can also keep them in a dishwasher but make sure you don’t run it too hot as some trays might warp with exposure to excessive heat. You can read our full guide on How to clean dehydrator and how to clean dehydrator trays on our site. Q: I just bought a dehydrator and it does not have a timer. All recipes I have include usage of a timer. What should I do? You can buy a small kitchen timer and use it with your dehydrator. If nothing else, you can use the timer on your smartphone to set up the time according to the recipe you are following. Drying herbs in a dehydrator can save you a lot of money and also give you delicious herbs to add to your food and dishes you plan to cook. Dehydrators reduce the time and effort it takes to dry herbs in open air. With a dehydrator you can get better quality of drying as all the moisture in the herbs is taken out by the heat and it all happens in a clean and sanitized environment. You can let the herbs dry and then crumble and store them as desired. The best part about dehydrators is that you can dry almost any kind of herb in these devices and that too in very less time as compared to air drying them. If you have a large stock of herbs, you can really benefit from drying herbs in a dehydrator and store these for whenever you need to use them. Simply store the herbs and use them as and when you need them. For more information about dehydrators, their features, popular models, use cases, and more, please browse through this website. You can also leave a comment with your queries or suggestions about what you’d like to see more of on this website. Happy shopping!